Dimensions: 58 x 39 cm approx. Sure to be a talking point, this Bear Side Table will be a quirky, decorative and practical addition to any room. The fun and surprisingly friendly looking grizzly bear will bring a smile to people's faces as he helpfully holds drinks, books, vases or other items. This is no ordinary side table and is a great statement piece. Showing 2 of our total 5 reviews, with an average rating of 5 stars. 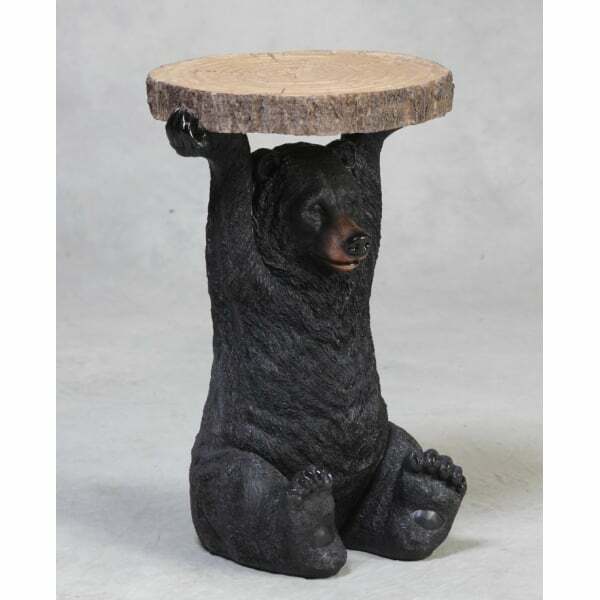 Read all 5 reviews for Hurn & Hurn Discoveries Bear Holding Tree Trunk Slice - Side Table . This is an amazing table solid and sturdy whilst giving you such pleasure, this bear is a real talking point. Excellent value and came extremely well packed and within twenty four hours. All round in a word PERFECT! Love this table, quirky and fun. I use it as a plant stand. It brightens up the room. The grandchildren are fascinated by him and greet him when they come round.